There is so much to think about when a loved one dies and you are faced with planning the funeral service. Here are a few pointers to help. 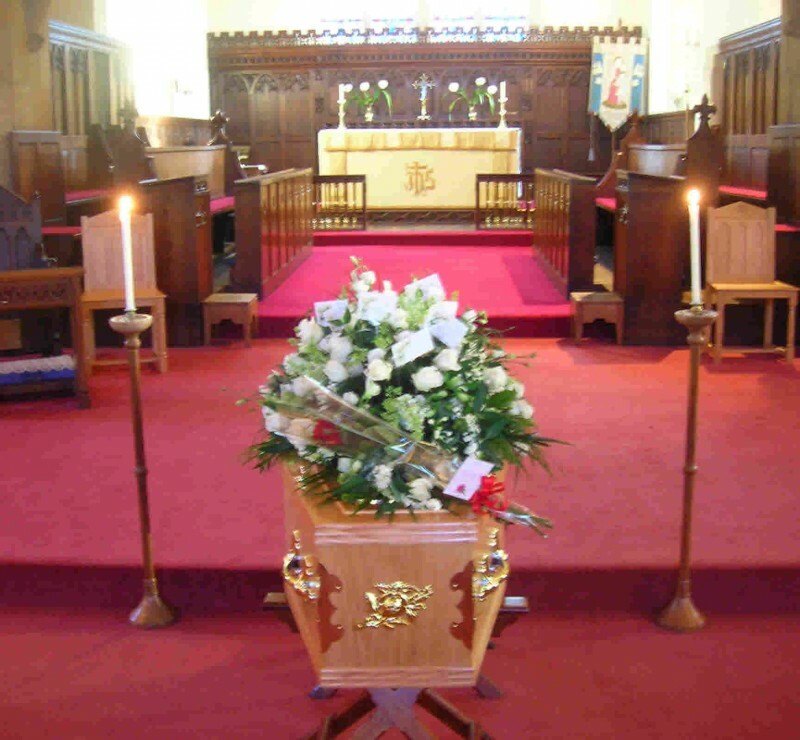 First of all, you do not have to be a regular Church attender to either have a Funeral Service in Christ Church or Saint Oswald's Church, or for the Vicar to take a Funeral Service at either of the local Crematoriums. As the Church of England we respond to all who live in the Parish regardless of whether they have attended Church or not. It is our privilege to show something of God's love and care for all, and we will always do the best we can. Do you want Burial or cremation? - did your loved one have any strong feelings? Burial gives you a place to go to afterwards if you need to grieve, and Great Ayton cemetery also has a Garden of Remembrance for cremated remains, and a plaque can be fixed to the wall. The Burial Ground in Great Ayton is a civic cemetery overseen by the Parish Council. The Churchyard around All Saints Church was closed for further burials back in 1880. The Parish Council set the rules and fees.. Does the Church Service have to come First? Assuming you are having a service in Church, many people today opt to attend the Crematorium first for a family Committal and then return to Church for a Service of Thanksgiving. This helps take the pressure off families in many ways, and we have no worries of making certain time slots afterwards. Family members also find this more positive and are often more able to participate themselves. A local service also enables villagers to attend. Many wish to follow straight on with a Funeral Tea, often in the Chuch Hall. If you choose just to have a service at a Crematorium the Vicar will attend there and also assist you with Service Sheets. Funeral Tea - It's not obligatory, but many do it. Usually our Coffee Lounge is available or local pubs and clubs are used. If you are the bereaved it is helpful to be able to leave if you want to, and not have a house full to the end. There is an excellent caterer in our village - Bib'N Tucker 01642 722 638. Music in the Service - We normally sing two or three hymns, and we have the facility to play favourite music electronically. This helps make a personal touch.We also have our excellent Organist who will play before the service as mourners gather as well as accompanying the singing. Orders of Service We can arrange your Orders of Service at a very reasonable charge in 2018 of £40 for 100 copies. These can include photographs on fronts at back. The Vicar will arrange these when he visits. Signing in Card If the service takes place in Church, all who attend will be asked to sign in as they enter, and you will get the card after the service as your record of who was there. Slideshows Christ Church has the facility to show Slideshows during a service. It is helpful if families can prepare the photographs in PowerPoint ratio 4:3 but the Vicar is always willing to assist if you are stuck. These can either be set to favourite music or used to illustrate the address. We do not charge for this service. Poems - as well as the Bible reading, people often include another poem or reading. Suggestions are on the next page. Skype Links Christ Church has broadband internet access, so if you have a family member abroad who would like to be part of the service, we can Skype them in. We have regularly connected with USA, Canada, Australia, South Africa and various places elsewhere in the Country. We do not charge for this service. The Address After the service it is custom for the Vicar to give the family a copy of the address given at the service. Memorial Book and Service We enter all funerals taken in our Memorial Book in Christ Church, and we have two memorial servcices a year on either the Sunday after Easter or Remembrance Sunday to which we invite the recently bereaved. We hope all Funeral Services can be as positive an occassion as circumstances allow, and we try our best to achieve this.